A Compass Clock, a gift of time and direction. 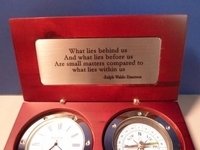 This compass clock is pre engraved with one of our two most popular quotes by Ralph Waldo Emerson. Choose one of the Ralph Waldo Emerson quotes for this timely compass gift. 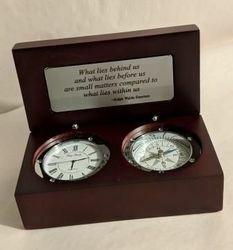 A wonderful gift for graduations, promotions, retirements or just for a little inspiration! This compass gift is ready to ship!